USB 3.0 – what is it and why should you care? A USB is a USB, what’s are you jabbering on about numbers for? Well the USB that you are probably used to is USB 2.0, this is USB 3.0, a new type of USB connection first used at the end of 2008 and starting to get more mainstream now..
And….. why should I care? Well, 10 times faster. This is where we turn to the usb specialists: USB 2.0 cables theoretically allow for the transfer of up to 480 megabytes of data per second, with speeds of 120 mb being more normal. 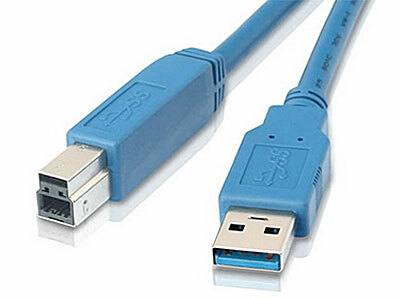 USB 3.0 can hit transfer speeds of up to 4.8gbs a second – up to 10x faster. Still, if I’m just just plugging my speakers into my laptop to power them up, then I don’t really need super-fast data transfer.. Very true, this is going to be most useful for products where there’s a heavy load of data travelling between devices and the computers, like when you back up your computer on a hard drive, or if say you want to burn films to blu-disks – that kind of thing. But my computer has only got normal USB ports on it. It works, it still works. One big advantage of USB 3.0 is that is backward-compatible with USB 2.0. You just need a USB 3.0 cable and a USB 3.0 capable device to get those top transfer speeds. What sort of products use USB 3.0? Hard drives – products that use USB 3.0 include hard drives like Buffalo’s 1terabyte DriveStation which promises transfer speeds of 150 mb/s. Blu-Ray disc burners also use USB 3.0 to allow for films etc to be burnt more quickly. It’s somewhat strange that USB 3.0 hasn’t taken of yet. Hopefully soon though.